11 Years After 9/11 and Islam Is Thriving. Do You Know Why? Occasionally, during my childhood, I would hear people of older generations talk about where they were when John F. Kennedy was shot. I remember my grandmother talking about it. I remember my mother talking about it. I didn’t quite understand why it was such an imprinted event for them. I wasn’t alive then and I didn’t really know who JFK was. I didn’t know the state of our country at that time and his effect and impact upon it. That was 1963. Fast forward 38 years later to September 11, 2001. Now I know exactly what they meant. I remember September 11, 2001. I turned on the news in time to see the second plane slam into the World Trade Center. So very sad. It tugs at my heart even now and I have a hard time not shedding a tear when I watch the videos of that day. There were people in those planes. There were people in those buildings. The reality? 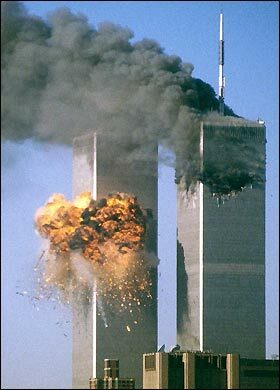 Islamic terrorists, acting on the fundamentals of their religion, flew airplanes into buildings in New York City and Washington, DC (and don’t forget Flight 93) and 11 years later, Islam has grown by 67% (1,000,000 new converts) in our country since September 11, 2001. Why? The number of U.S. mosques has increased by 74% (by nearly 1,000) since 2000. Why? Why the attraction to such a hate-filled religion? How can this be with such an in-your-face example of what Islam teaches right here in our own country? Does anyone have a good explanation as to why this is happening? Does anyone have a good explanation as to why Islam has received privileged treatment in our country and around the world? Does anyone have a good explanation as to why our leaders are doing everything they can to accommodate and encourage the growth of Islam even to the extent of trampling on our own, God-given, Constitutional rights and freedoms? I have an explanation. But first, I want to show you what’s really been going on since 9/11. Did you know that some areas of the UK are considered off limits to non-Muslims? Were you even aware this was happening in the UK? But then, how can you be if your only source of information comes from the evening news. Watch these things and ask yourself why you don’t know about them. Ask yourself why our news media refuses to report on them. Ask yourself why you’re not being told. What happens in the UK will happen here. It already is. They’re just a bit further along. Did you know about Dearborn, Michigan? It’s affectionately known as Dearbornistan. Did you know about the paramilitary training happening in Holy Islamville, South Carolina? Did you know about the 22 other places in our country like this one? Did you know that the New York City Police Department used this very informative video made by a self-proclaimed moderate Muslim to train its personnel about the dangers of Islam? Go to the web site and read about the film. Ironically, the NYPD caved into the very pressure tactics used by Islamists that the video speaks of and stopped showing it. Amazing! I want to hear what your explanation of why Islam is being given a free pass is because, you see, I have one. I believe the Bible prophesies Islam as Satan’s chosen religion that he will use to set the scene for the rise of his man, the Middle East right now with the so-called Arab Spring which will result in anything but democracy. There has never been a more Antichristian religion in the history of the world. Consider it is the teaching of fundamental Islam that Muslims should kill the infidels wherever they find them. There’s no dispute that Islam actively seeks to kill Jews and Christians, but that command also includes atheists and people of all other faiths. Consider there’s an Islamic mosque on the Temple Mount in Jerusalem. Consider that on the inside of the mosque it reads “There is no god but Allah and he has no son”. There’s a territory war going on between Satan and God and even though Satan knows how it will end for him, that hasn’t stopped him from trying to usurp God’s throne. That is why his efforts are all the more rapid and urgent and also why the results of his efforts – the flourishing of Islam – seem so unreasonable to the rational person. Consider every nation listed in the Bible that Christ does battle with and defeats upon His return is currently an Islamic nation. You can find them all in the Old Testament. Consider Daniel 12:4 says his prophesy concerning the identity of the last beast kingdom will only be unsealed, or understood, at the proper time – the time of the end. People will be searching the pages of his book to find the answers. It’s happening now and the conclusions point to a revived Islamic Caliphate in the Middle East. Consider our leaders and the non-Muslims continually giving in to Islam and insisting it is a peaceful religion despite all evidence to the contrary are caught up in the deluding influence 0f 2 Thessalonians 2:3-12. Why do we still continue to look in Europe? It is where it is, where the Bible always said it was, where Biblical action has always taken place since the time of Genesis – the Middle East. Our descent into fascism, our tyrannical trek toward totalitarianism will only serve as the gateway for an even greater evil to thrive – Islam. There’s no doubt that the West is seeking to impose a unified global rule. The forces involved don’t even try to hide it anymore. They haven’t for a long time. An environment has been created where it is no longer necessary to hide what has been the agenda for decades, probably longer. Part of that environment is the stark reality that we citizens no longer have any power or say in what actually happens and so it is no longer necessary to try to hide things. If you are only looking at the New World Order (or what I believe to be the more appropriate name – the New Western Age) you are only seeing half of the picture, and it’s the less important half. What’s even more pressing than the West trying to take over the world is Islam. It has the same ambition. However, the West severely underestimates its hatred and that will be the West’s downfall. The West’s totalitarian ideals have opened the door for something even more brutal and has actually been an enabler to Islam’s growth. Consider our current state of the emasculation of our society through ideals such as tolerance, moral relativism, a non-belief in evil (and God), the idea that no one should ever feel offended and political correctness to name a few. Imagine those things on one side of the battlefield and the hatred of Islam for anything other than itself on the other. Hmmm. Only one of these can win and it doesn’t look well for us, earthly speaking. You might even say Satan is stripping us bare while he builds the vehicle that will bring about his coming kingdom. I would, and do. And, as you saw above, it’s happening now. Where is the Church? A majority of Christians are still looking in Europe for an Atheist Antichrist from Rome. Even those who are not followers of Christ occasionally glance in that direction. In all fairness, Daniel did say that these realizations about the true nature of the beast would not be known until the time of the end [12:4]. That means that interpretations prior to God’s unsealing of the prophecies in the Book of Daniel cannot be correct. However I also see a general lack of interest in Bible prophecy by Christians and an unwillingness to re-examine the evidence in light of Scripture by many prophecy teachers. Shame on all of us for not doing our homework in regard to Bible prophecy! A note on the proposed mosque at Ground Zero. Islam, in its conquest to conquer the world, strikes the U.S. in New York. Victory is declared around the Islamic world and, soon after, the construction of a mosque is planned at that very site. Such is the way with Islam. Once a territory has been considered conquered, one of the first things Muslims do is build a mosque to show dominance. Did you know that, originally, the mosque being proposed at Ground Zero was to be called the Cordoba Mosque? Do you know why? It’s the very same name of the mosque built by Muslims after the Islamic conquest of Cordoba, Spain beginning in the year 756 AD. The mosque was actually built in 785 AD. That is what this mosque means to the Islamic world. Anyone who studies Islamic history knows there can be no mistaking Islam’s intention here in our own country.